Midway through Toy Story 3, Hayao Miyazaki’s most beloved creation, Totoro, makes a cameo appearance. The nod seems to be borne out of the Pixar creators’ stated respect for Miyazaki’s work, but nonetheless comes across as mild hubris, given that the obligatory, imagination-bereft Toy Story 3 pales in comparison to any of the animated wonders that Miyazaki’s Studio Ghibli has produced. Technically well-crafted (with the significant exception of 3D effects that seem like an obvious afterthought), the film blandly recycles both the jokes and themes of its predecessor, this time with the separation anxiety of cowgirl Jessie contaminating the whole toy box as their owner, Andy, begins preparations to leave for college. This theme of rejection has arguably been central to the Toy Story series since Buzz displaced Woody in the first entry, making the sequels’ focus on the same material feel redundant. More troubling than that continued lack of thematic imagination, however, are the characters and plot elements in this third entry that seem to have been cribbed from the previous franchise entries. Once again, space hero Buzz Lightyear reverts to factory settings and turns on his fellow toys. Lotso, a malicious Teddy bear, comes off as a Stinky Pete retread. The basic plot, which recycles numerous prison escape films, is a tired inversion of Toy Story 2’s rescue operation. That the overall level of invention would be reduced is to be expected in a second sequel, one could argue, but that makes this film feel no less stale. Toy Story 3 strives to invoke the audience’s sense of nostalgia, both for the characters in the film and for the retail products that they signify. Watching the movie, however, the nostalgia that I felt most strongly was for animated features produced in the pre-Shrek era. 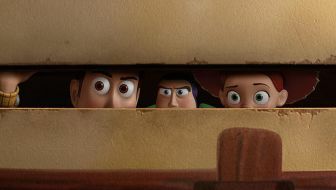 Toy Story 3 frequently indulges in the cheap brand of crass humor that has defined that series, with fart jokes, ethnic jokes, and gay jokes throughout its run time. All of this seems well beneath the level of sophistication that people insist Pixar films possess, and suggests something of a shark jump for the studio. Beyond such quibbles, the threadbare plot of Toy Story 3 raises another cause for complaint. While the series’ willingness to grapple with the disposability of toys is commendable, the sappy ending, in which Andy, on the verge of manhood, regresses considerably, renders much of the complexity of what has come before moot. Since the emotional core of the film is left over from its predecessors, the focus of the movie falls on its action set pieces, all of which are pitched at the same level and grow redundant. This is unfortunate, because Toy Story 3 has little to offer adult viewers beyond those endless chases, coy referentiality, and its sole thematic obsession. For children, and children at heart, it might be enough. At best, Toy Story 3 stands as a refinement of Toy Story 2, a movie which was an unnecessary sequel to begin with.